Didn’t know S&S made their own exhaust products? Well we do, in LaCrosse, Wisconsin and there are several really good reasons why we prefer to make our own products rather than outsource them. This goes for just about any parts, not just exhaust systems. A big reason is quality. We can keep track of the product quality and correct any issues while it’s being made, rather than find out there’s a problem when a shipment arrives in our warehouse. Worse yet would be to find out when customers call up to complain about it. At the S&S Cycle LaCrosse facility the first thing you see is the racks of steel tubing in 20 ft sections. Sizes range from 1-3/4” diameter to 4-1/2” diameter. This tubing is used to make everything from header pipes, heat shields, muffler bodies and internal components, it’s all done here. The tubing is cut to length on the cut off saw. The length and diameter depends on what they are going to make out of it. For example, if we’re making MK45 muffler bodies, they’ll be cutting 4-1/2” tubing. If it’s header pipes it’ll be 1-3/4”. Heat shields are made from 2-1/4” tubing. The CNC tubing bender is the key player in making header pipes. 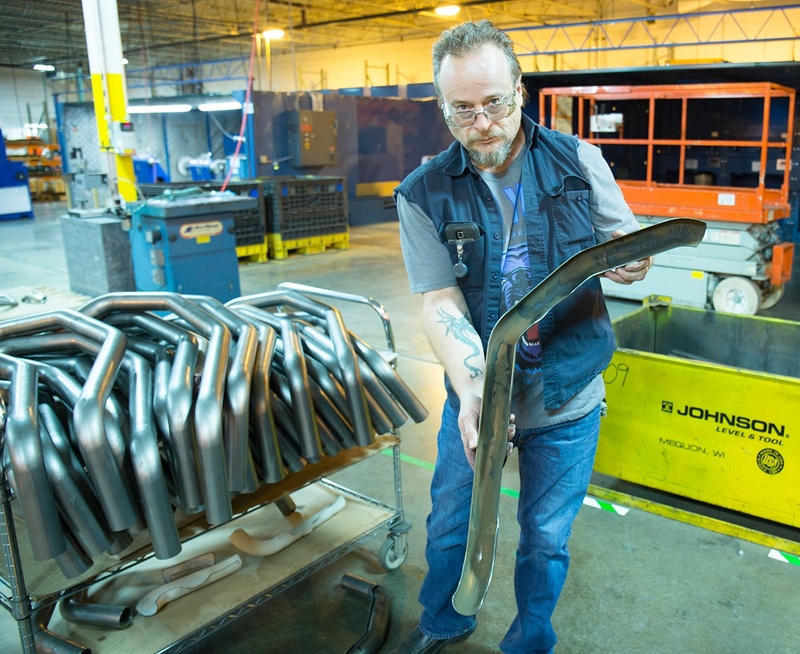 It takes a 20 foot long straight section of tubing (a "stick") and within a matter of seconds, a series of complicated bends have been made, forming multiple pieces of one of our exhaust sytems. From there, the tubing will be cut into the appropriate segments, deburred and set into fixtures for welding. Painstaking care is taken during each step to ensure the highest quality standards and exact fitments are met. For a perfect fit to the tapered gaskets in the cylinder head port, the exhaust inlet is formed with specially manufactured tooling for a leak proof seal and great flow characteristics. 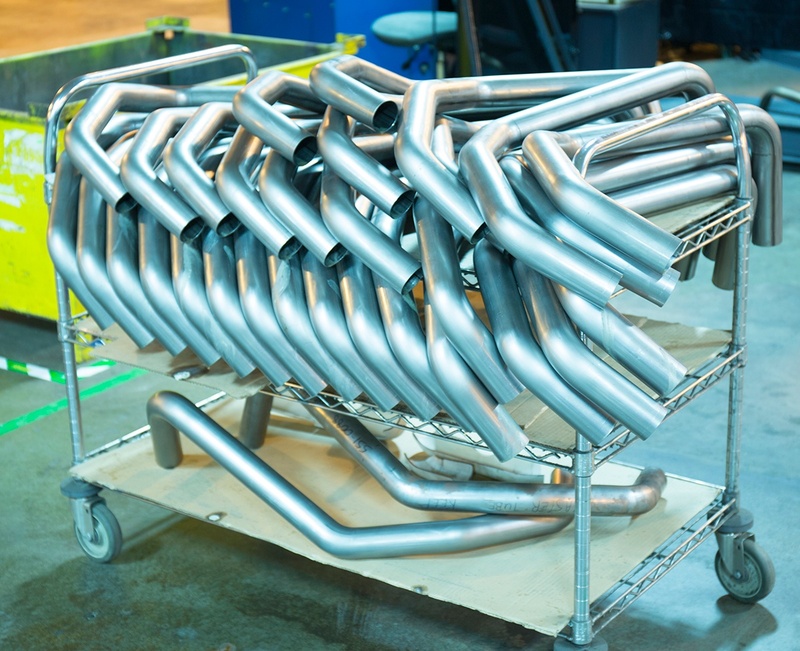 All S&S headers are made from mandrel bent 304 series stainless steel for kink-free smooth bends to enhance the performance and durability of our systems. If you think that is spectacular, let’s go over the heat shields. Making heat shields is even cooler. 2-1/4” tubing is bent on the same CNC tubing bender to flow over the exhaust pipe. Then the bent heat shield tubes are cut with surgical precision by a robotic plasma cutter. The unused portion of tubing is recycled, and what remains is a smooth seamless heat shield that gets sanded, polished and then coated in high temperature black ceramic or show chrome for a flawless surface, which makes our pipes look as good as they perform! Another unique advantage of our LaCrosse manufacturing facility is that we make our own parts. 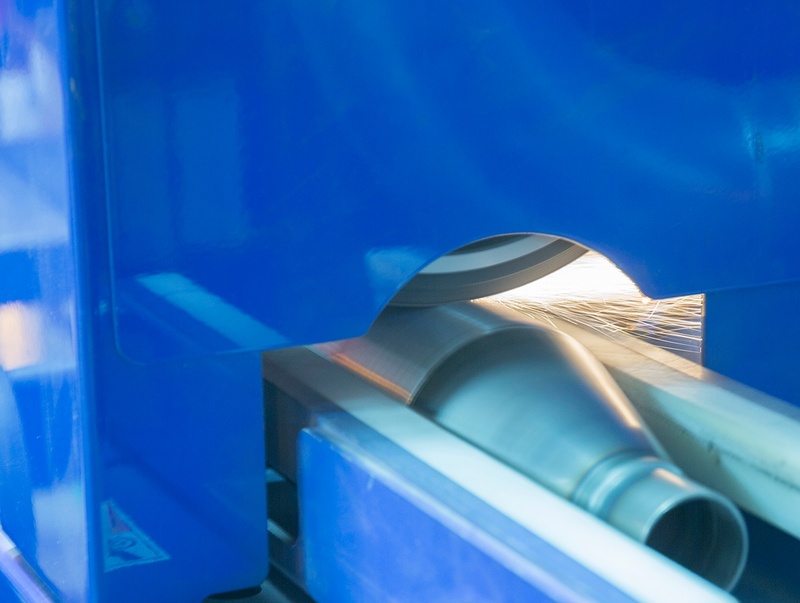 Rather than buying pre-formed pieces from tubing manufacturers, we have our own forming machines, allowing us the flexibility to make almost any shape we can dream up. 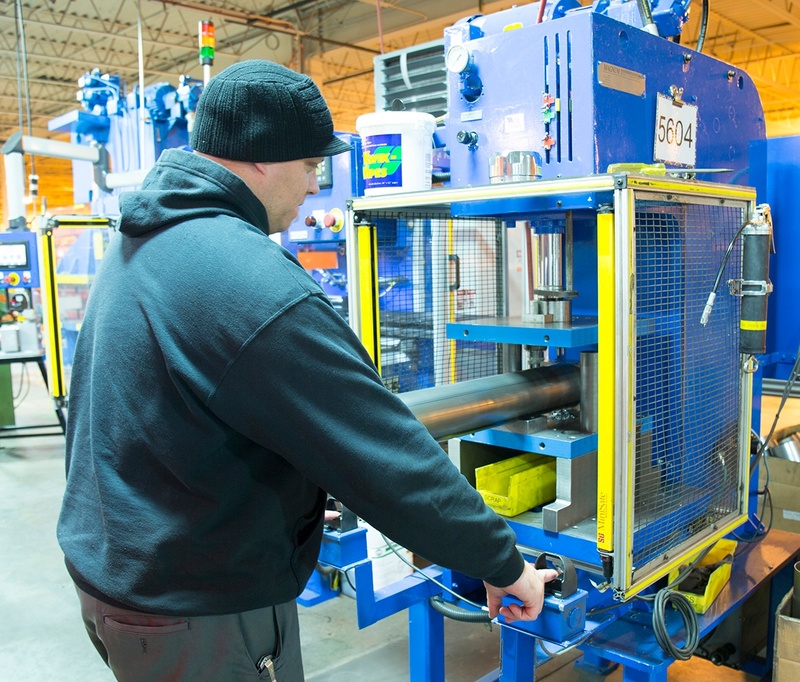 A very simple example is how we make our touring slip-on mufflers. Most other exhaust manufacturers buy pre-formed shells, put a louver baffle inside and their badge on the outside and sell it to you. 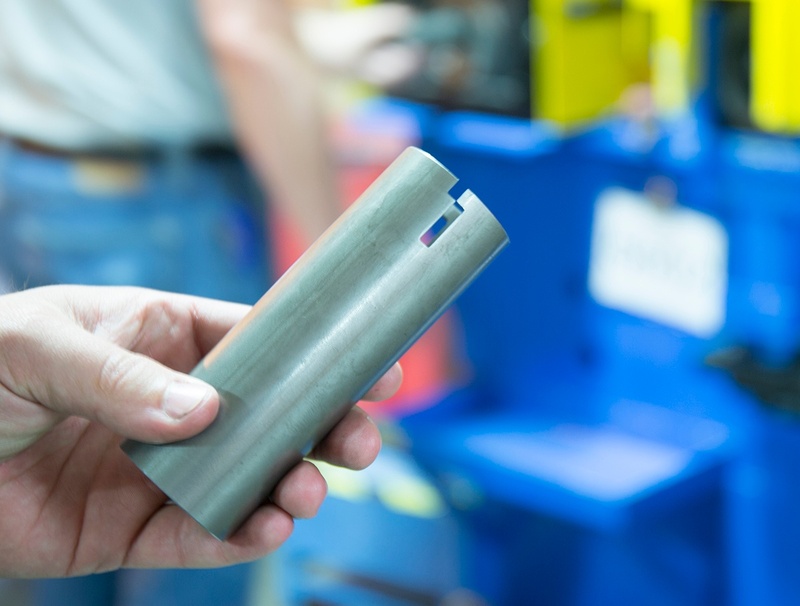 At S&S, we cut raw 4-1/2" tubing to length and run it in our forming machine through a series of dies and processes that makes a perfect inlet cone, every time, to our exacting tolerances. The formed muffler is then squared up, has an inlet tube welded in and run through the first stage of automated polishing to prepare it for high temperature ceramic black or show chrome plating. Of course you expect your motorcycle exhaust to perform, but it also has to look great! On your car, all you can see of the exhaust system is the end of the tail pipe. Slide a chrome tip on it, and life is good. On a motorcycle, the exhaust is highly visible from end to end, and it’s a matter of pride to most riders that their exhaust lives up to the high standards they hold their bikes to. 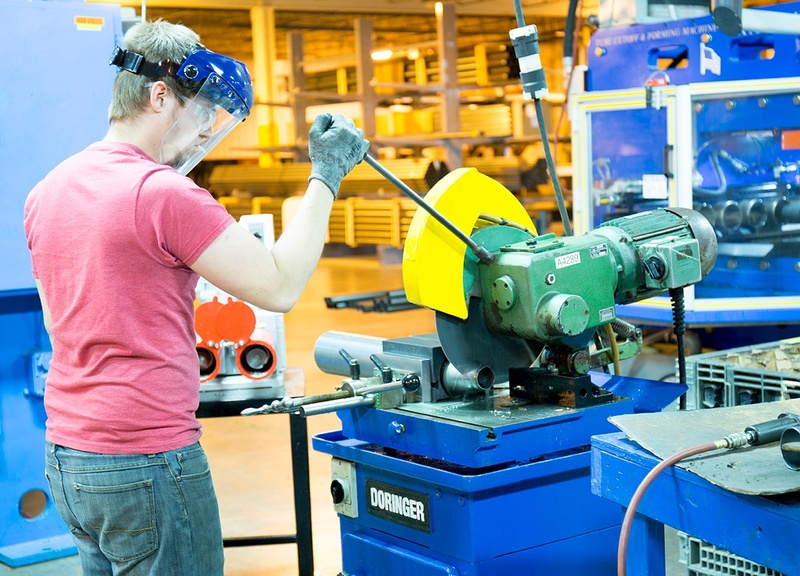 Whether it is an automated process with our state of the art robotics, or good old fashioned work by hand, our American craftsmen and women take pride in their work to deliver the best to you from our facility right here in LaCrosse, Wisconsin. 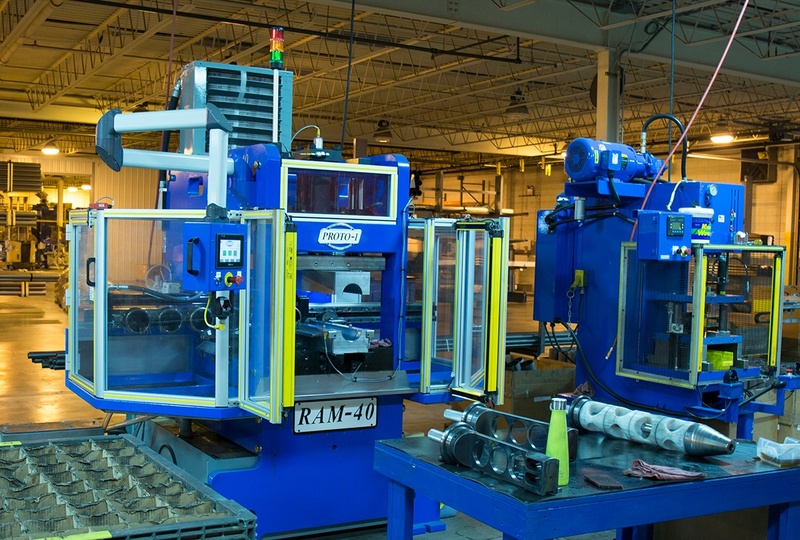 This machine punches a specially designed sealing notch in the muffler inlet tubes. When clamped, this notch will provide a leak free seal. This press punches precisely located holes in the muffler body for end cap screws. This machine forms the cone shaped inlet of the muffler body, reducing the diameter of a 4-1/2” steel tube to under 2” in five hits. 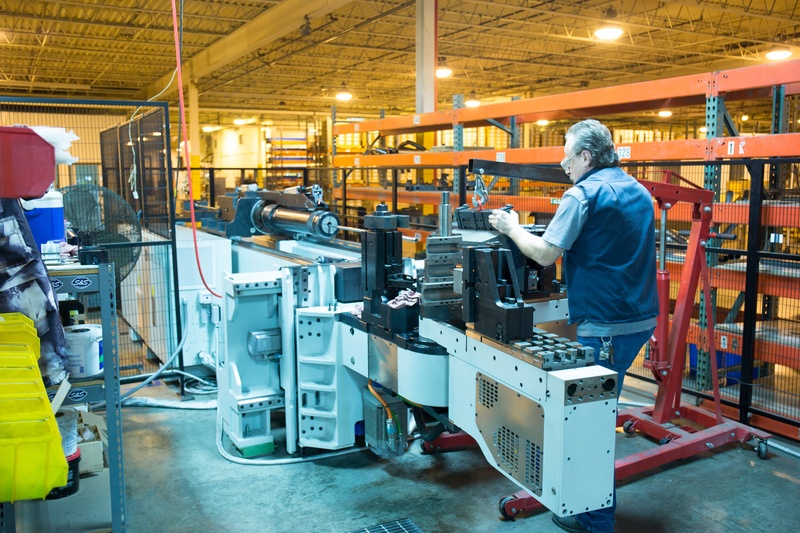 Every step of the manufacturing process uses tight tolerance fixtures. Here the formed inlet cone of a MK45 muffler is squared up in the chop saw. 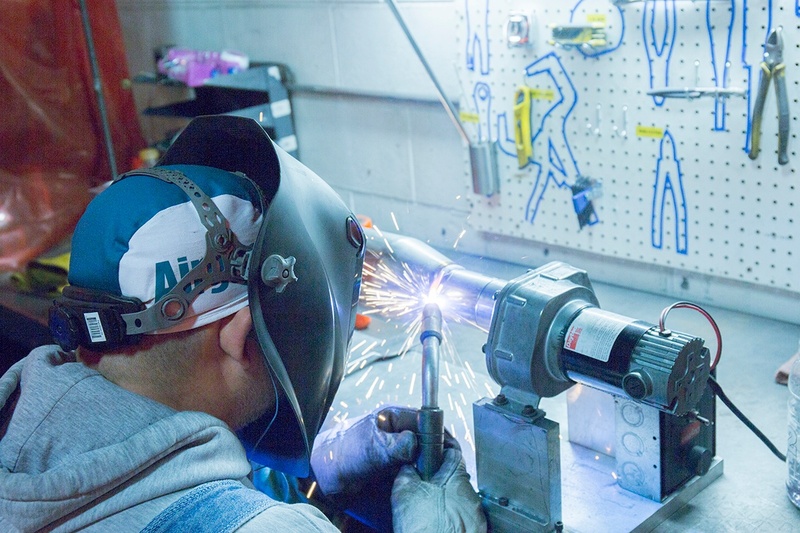 Rotating fixtures allow our skilled manufacturing staff to fully weld tubing parts in one pass. Once a time consuming task done by hand, this automated polisher performs the first step in the cosmetic finishing process in a matter of seconds. Bent tubing destined to become a heat shield placed in the press that applies the S&S logo. Proven Performance, and quality! The S&S logo stamped in a header heat shield. The CNC tubing bender can be configured to bend any size tubing needed for motorcycle exhaust. 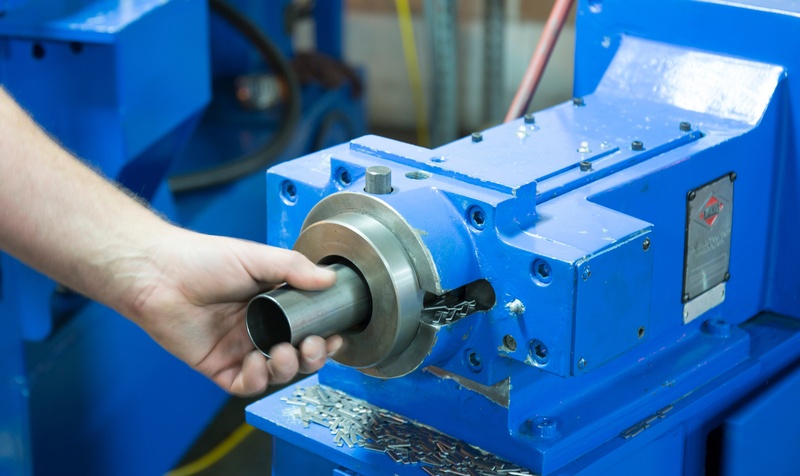 S&S staff regularly change out the heavy tool steel mandrels to bend different size tubing. Heat shield tubes waiting to be cut on the robotic plasma cutter. 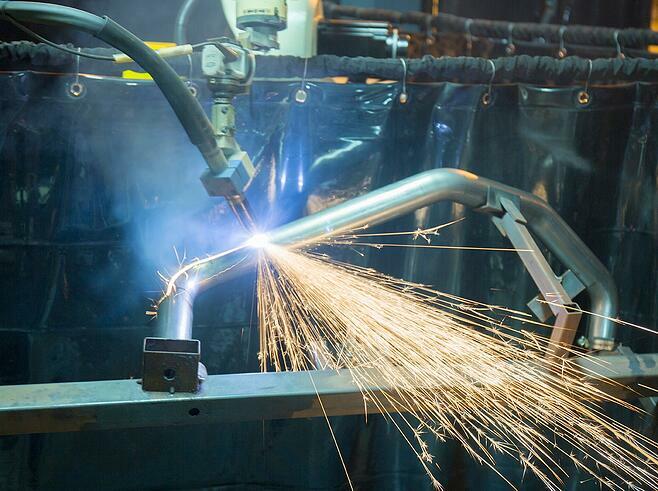 The robotic plasma cutter slicing through bent 2-1/2” tubing during heat shield manufacturing. Full coverage one piece heat shield ready for final processing and high temperature black ceramic or show quality chrome plating.